Designed to cut the log horizontally and vertically, the single thin kerf blade of a Peterson swingblade circular sawmill pivots from the horizontal position to the vertical position with ease. Each cut of the log intersects at a precise point resulting in perfect boards every time as is the joy of swingblade sawmills. 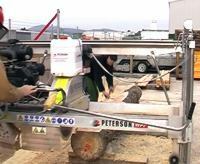 Peterson Portable Sawmills use a unique process where a power head drives a tungsten-tipped circular blade through a log, which then rotates 90 degrees to achieve both horizontal and vertical cuts, in order to free a perfectly dimensioned piece of timber from the log. A rise and fall mechanism is mounted within a carriage which is pushed and pulled upon parallel tracks over a stationary log. To start a log, the blade unit is positioned at the top left of the log, with the blade in a horizontal position. 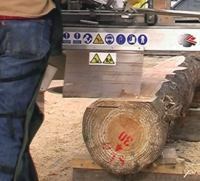 The operator gently pushes the mill frame through the log to affect the first cut. Carriage movement through the log requires about 10 lbs. pressure as you are letting the blade do most of the work. 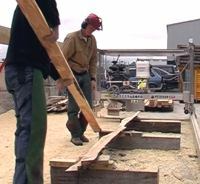 A simple hand movement swings and locks the cutting unit into a vertical position, which is then pulled back down the log. Due to the originality of the design, no special locking mechanisms are required, making the whole process quick and simple – many of our customers comment on how easy it is to use in comparison to other brands! 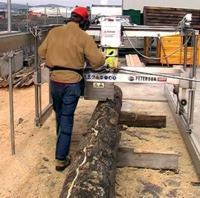 The operator now pulls the unit back through the log in the vertical position to complete a cut. Your dimensional board is now free for removal, and fully edged! 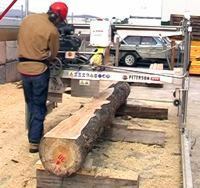 Once a row of cuts across the log face has been completed, the entire unit is lowered to the desired depth of the next cut. This is done using a simple hand or electric winch, and takes about 5-10 seconds. These steps are repeated until you have only a thin firewood slab remaining at the bottom of the log – you have no need to move the log at any time during the whole sawing process. The concept is extremely inventive, but surprisingly simple. One of its many strengths is the Peterson’s ability to handle a wide variety of cuts. Running a single blade instead of two at once also means you do not need a huge motor, which reduces both overall costs and weight. The cutting begins at the top of the log with the blade in the horizontal position, where small waste pieces are removed to expose the first useable layer of the log. N.B. The horizontal cut is always done pushing forward, and the vertical cut is always done pulling backward. Once the top of the log has been levelled you can now lower the center unit with two winches (ATS), one winch (WPF), or an electric winch (WPF and ASM). 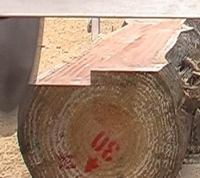 Once you have reached your desired depth of cut, you can remove the waste edge from the left of the log by cutting forward horizontally to the far end of the log, and then pivoting the blade into the vertical position and pulling backwards. Remove the waste piece of timber. You can now cut your first board. With the blade in the horizontal position, move the horizontal sizing slide to the desired width of board. Then unlock the center unit, and wind it to the right. The center unit will not go any further once it has reached the width marker. You can now push the blade through the log until you have safely cleared the end of the log. You then pivot the blade into the vertical position using a lightweight handle, and pull the mill unit back towards you to free your board. The process continues, as the log is milled one layer at a time, until nothing but waste at the bottom remains. 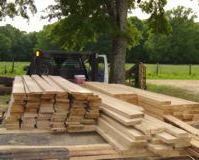 The result: plenty of valuable timber with very little waste. For further research, see the article Sawing with a Swingblade.